As the Australian summer gets into full swing, the ritual that is our annual migration to a holiday in the sun begins. Australia is rightfully renowned for our beautiful sun-drenched destinations. Unfortunately, all that sun comes at a cost in terms of sun safety. Sadly, Australia has one of the world’s highest incidences of skin cancer. Each year more than 2,000 Australians die from skin cancer and a staggering two in three Australians will be diagnosed by the time they turn 70. Melanoma is the most dangerous form of skin cancer but fortunately the least common. If not detected and treated early, melanoma can spread to other areas on the body with fatal results. Melanoma usually starts on areas with high exposure to UVR (ultraviolet radiation) like your neck, face, back and lower legs. However, melanoma can develop on any part of your body, even skin that isn’t exposed to UVR. 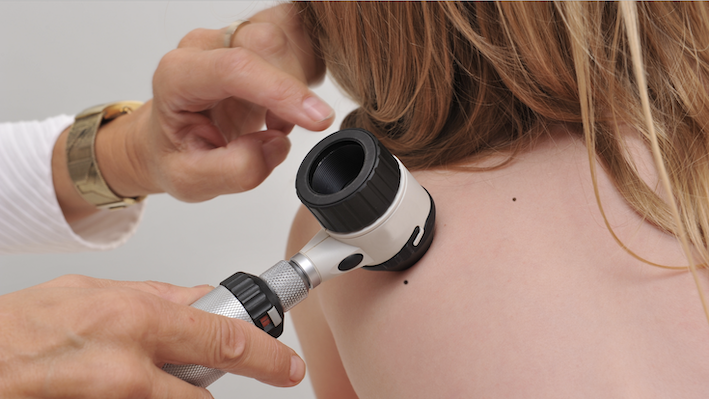 The first sign is often a new spot or an existing mole or spot that changes colour shape or size. Melanoma has a high survival rate if diagnosed early and treated. Nodular melanoma is a quick-growing form of skin cancer. It can be life-threatening in six to eight weeks if not detected early and promptly treated. Nodular melanoma usually appears as a small, round red, pink, brown or black, lump on your skin. Perhaps most common and least dangerous type of skin cancer, BCC often appears as a pale, red, or pearly scaly area or lump. BCCs are slow growing and are usually found on the face, nose, ears and neck. These Squamous Cell Carcinomas (SCCs) are more commonly diagnosed than melanoma. SCC may not be as dangerous as melanoma but if not treated they can rapidly spread to other areas of the body. SCC on your lips or ears has the greatest risk of spreading. These need to be checked immediately by your doctor. SCCS typically starts on high sun exposure zones including your face, head, hands, arms and neck. SCCs usually look like thickened, scaly red spots that don’t heal. A key warning sign of melanoma is a mole, spot or blemish that changes its size, colour or shape or a new spot that appears on your skin. Look for part of a birthmark or mole that differs to the other. Check for spots with blurred, notched, ragged or irregular edges. Be aware of spots that have different shades of black or brown in them or occasionally patches of white, blue, red or pink greater than 6 millimetres. Getting naked to check your freckles, moles, age spots and blemishes may not be the highlight of your day but it is a savvy move, particularly if you’re over 30. Catching a problem early offers the best chance of survival. Using a mirror check the back of your neck and scalp and use a blow dryer set on low to examine your scalp. If you discover a warning sign or a potential problem mole or spot, have your doctor check your skin immediately. Check your skin each month and become familiar with your skin. Look for new spots or markings, or one that has changed in shape, size, colour or feel. Monitor your skin for unusual blemishes, sores, lumps, or changes in how your skin looks and feels. Be especially vigilant for bleeding, oozing or crusting together with tenderness, itching, or pain. How Frequently You See a Doctor For a Full Examination? Every Australian adult should have a full body exam at least once a year. Whether you have a skin condition or not, seeing your doctor for an annual exam is a smart part of your regular healthcare routine. Remember; always see a GP right away if you discover any suspicious warning signs. It’s important you find a doctor who has the right experience and qualifications. All of our doctors have their profiles listed on our website making it easy to understand their background and clinical interests. To book an appointment, simply visit our website, select your preferred location, and physician and book a convenient time. Alternatively, call our practice’s number listed on the website. Integrated Medical Solutions Group is a fully accredited, Australian, privately owned and operated network of medical clinics. We’ve been servicing our patients for over 40 years and we are committed to providing comprehensive, patient-centered care. We are dedicated to ensuring our patients enjoy the highest level of quality, affordable and accessible care. Contact us online or call one of our practices today to arrange a consultation to assess a particular mole or to perform that critical annual skin check.